Club Penguin Cheats by Mimo777 Club Penguin Cheats by Mimo777: Card-Jitsu Snow Reviewed By You! 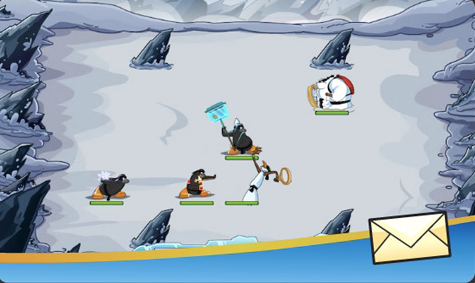 Last week Club Penguin asked us what our ultimate spy gadget be? Saweet review! Gotta love food, right? For the next review, Club Penguin wants to know what has been your best Card-Jitsu Snow strategy so far? Hmm, good question. Anyone out there have a good answer? Yep! I always use Power Cards first on the snowmen so that they're weaker to start with! Then I make sure that the other ninjas are always healthy and ready to battle! I never chicken out because to many are on me! I battle and battle till we heal me. my secret is play as snow and when the enemy who holds a sled pops up only the snow can defeat him with out being hit by him!